When CJ Rice was looking for a master’s program in history, he wanted a couple of things: To be closer to family in North Carolina and to find a place where he could study ancient languages while working on his degree. Rice found all that and more at NC State University, as well as excellent faculty who became his mentors. Last week at the Southern Conference of Graduate Schools meeting in Annapolis, Rice was recognized as the winner of the SCGS Outstanding Master’s Thesis Award in Humanities and Fine Arts. 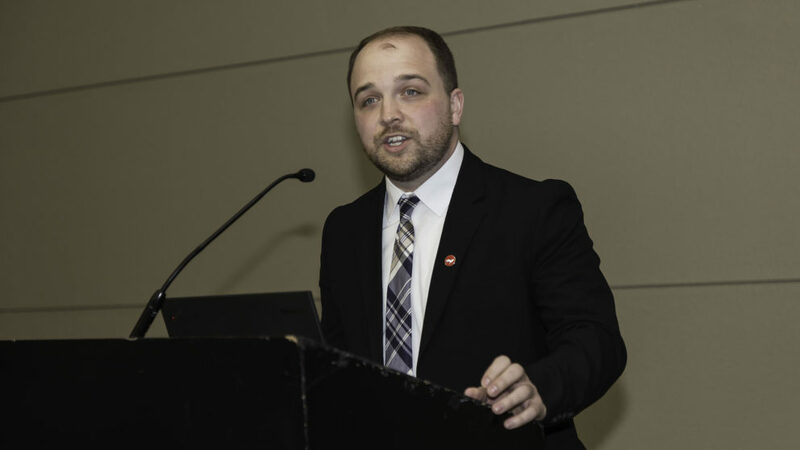 And this was not the first time that he has earned accolades for his master’s thesis, “Diocletian’s ‘Great Persecutions’: Minority Religions and the Roman Tetrarchy.” The history department and the College of Humanities and Social Sciences at NC State also recognized his thesis last year. Rice’s thesis focused on the persecution of Christians and other religious minorities in the Roman Empire at the beginning of the fourth century. While studying at NC State, Rice served as a teaching assistant for Ancient History, a course that focuses on several thousand years of human history. He also participated in the Graduate School’s Certificate of Accomplishment in Teaching program. 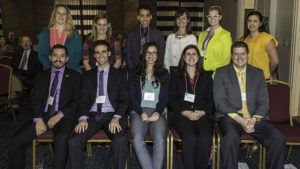 Gilbert Castillo, far left, front row, is pictured with other members of his heat at the Southern regional 3MT competition. Rice is now in his first year as a Ph.D. student at Yale University. He may expand his master’s studies on religious violence in late antiquity. He also hopes to explore how men and women in ancient Rome understood issues of gender and sexuality. He would like to continue research and be engaged with students, with an eye toward a professorial career in the future. During the conference, 45 students from universities across the Southeast competed in a regional 3 Minute Thesis contest. Gilbert Castillo, a Ph.D. student in biomolecular engineering and winner of NC State’s 2016 3MT contest, was among the students competing on the regional level.